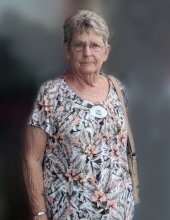 Graveside services for Jo Ann Phillips, 78 of Kershaw will be held at 2:00 o’clock pm, Wednesday, April 3, 2019, in Kershaw City Cemetery. Rev. Dr. Jason Moss will officiate. Burial will immediately follow the graveside service. Mrs. Phillips died Saturday, March 30, in Providence Hospital, Columbia. Born in Great Falls, she was the daughter of the late Hoyt Croxton and Annie Hinson. She was a former employee of Springs Industries and a faithful member of Kershaw Second Baptist Church. Mrs. Phillips also loved to fish, bowl and camp in her spare time. Surviving are her loving husband of 60 years, Roderick “Pete” Phillips of the home; her son, Jesse Phillips ; her daughter, Rita Phillips Payne and her husband Donnie all of Kershaw; 4 grandchildren, Daniel (Danielle) Payne, Jessica (Thomas) Samuels, Brittany (Marty) Hinson and Ashley (Brandon) Croy; 2 great grandchildren, Kole Samuels and Trey Hinson; her brother, Hoyt “Junior” Croxton and 2 sisters, Nell Gilreath and Betty Bryant. The family will receive friends anytime at the home. Memorial contributions in memory of Mrs. Phillips may be made to Kershaw Second Baptist Church, 7737 Kershaw-Camden Highway, Kershaw, SC 29067. To plant a tree in memory of Jo Ann Phillips, please visit our Tribute Store. "Email Address" would like to share the life celebration of Jo Ann Phillips. Click on the "link" to go to share a favorite memory or leave a condolence message for the family.